Pencil Eraser Poisoning is the accidental or intentional intake (chewing and swallowing) of pencil erasers. This condition is mostly seen in children. What is Pencil Eraser Poisoning? What are the Causes of Pencil Eraser Poisoning? What are the Signs and Symptoms of Pencil Eraser Poisoning? How is First Aid administered for Pencil Eraser Poisoning? Who should administer First Aid for Pencil Eraser Poisoning? 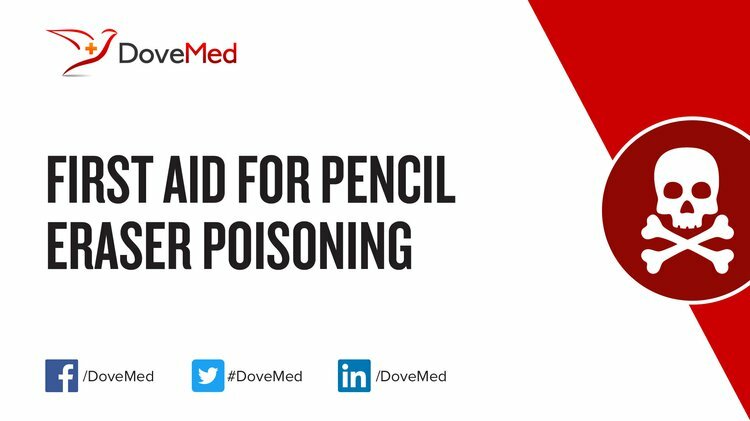 First aid for Pencil Eraser Poisoning is administered by healthcare professionals. What is the Prognosis of Pencil Eraser Poisoning? How can Pencil Eraser Poisoning be Prevented? Chiong, C., Ostrea Jr, E., Llanes, E. G., Villanueva-Uy, E., Reyes, A., Gloria-Cruz, T. L., & Reyes-Quintos, M. R. (2012). Auditory brainstem response latencies of infants and maternal exposure to environmental toxic products. Early detection and screening for childhood deafness in the Philippines, 46(3), 53. Yikmis, M., & Steinbüchel, A. (2012). Historical and recent achievements in the field of microbial degradation of natural and synthetic rubber. Applied and environmental microbiology, 78(13), 4543-4551. Linton, C. P. (2016). Skin Test. Journal of the Dermatology Nurses' Association, 8(3), 231-234. Kim, K. K. (2012). Contents character of phthalates in school supplies. Analytical Science and Technology, 25(1), 69-75. Davydovski, A., Jiang, J., Vishwakarma, S., & Leung, V. (2014). An investigation into eco-friendly office supplies: pencils and mechanical. Nayak, S. V., Kini, R., Shetty, U., Rao, P. K., Kashyap, R. R., & Bhandarkar, G. (2017). Pica-an eating disorder: A report and review. Archives of Medicine and Health Sciences, 5(1), 82. Laya, B. F., Restrepo, R., & Lee, E. Y. (2017). Practical Imaging Evaluation of Foreign Bodies in Children: An Update. Radiologic Clinics of North America, 55(4), 845-867. A-Kader, H. H. (2010). Foreign body ingestion: children like to put objects in their mouth. World journal of pediatrics, 6(4), 301-310. Bohon, C. (2014). Feeding and Eating Disorders. Study Guide to DSM-5®, 233. Bohon, C. (2014). Feeding and eating disorders are characterized by the altered consumption or absorption of food that results in problems in physical health, psychological wellbeing, or both. This diagnostic class combines the previous DSMIV diagnostic class of eating disorders with some of the childhood disorders, including feeding disorder of. Study Guide to DSM-5®.